We’re always looking for ways to improve The Odyssey Scoop experience. Our latest endeavor improves the overall navigation as you explore the various features at the website. Today, we’re excited to introduce our new and improved navigation bar. 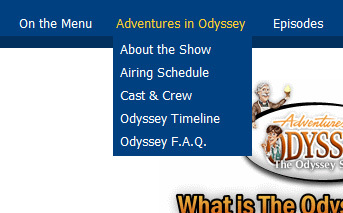 New dropdown menus give The Odyssey Scoop a fresher, cleaner look with improved organization. The main navigation bar contains The Odyssey Scoop’s prominent features at an at-a-glance format. You’ll notice that accessibility to certain under-emphasized site features are now more visible. Of the enhancements you’ll see, the “Episodes” category now breaks down our vast Episodes section into various sections so you can access information more quickly from any page of the site. 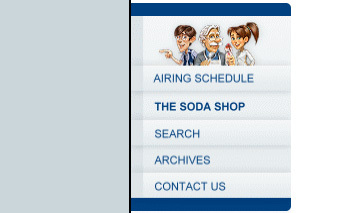 Our new left side hot links section gives you quick access to vital Scoop features, including The Soda Shop Message Boards. We hope these improvements will give you a better experience here at the Scoop. Of course, you’re more than welcome to share your thoughts and suggestions in the comments below. We’re excited to move forward with our new look. Take some time and familiarize yourself with our improved navigation. As always, you will be seeing slight changes and improvements in future days. For now, our blog section hasn’t been updated with the look but will be soon. The rest of the website is new and improved. So… start navigating!